Home: Broadway Dance Studio offers professional and fun Ballroom, Latin & Salsa classes. 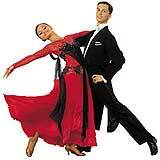 Ballroom & Latin classes consist of classical ballroom and international latin. In the Beginners classes you will learn the basics of Waltz, Social Foxtrot, Cha Cha Cha, Samba, Rumba & Jive. As you progress to the Intermediate classes you’ll learn Quickstep, Foxtrot and Tango plus more choreography and technique to the dances you already know. Classes focusing on the dances Waltz, Social Foxtrot, Quick Rhythm and Rumba, which are the most suitable for wedding parties. These are small groups (4 to 10 students) that progress beyond normal class level. More advanced choreography and technique is taught by experienced world class teachers. These are small group (four to ten students) in a private lesson. Suitable for wedding groups. Ballroom/Latin and are fixed term classes of 1 hour per lesson per week for a duration of 8 weeks. Unless notified classes are run on Public Holidays. Missed classes – see Fees page. All age groups welcome. No partner required. Phone bookings are essential. To secure booking, payment is required. Payment can be made by Credit card over the phone or by Internet Banking. Payment must be received prior to commencement of class term.